Social media: What is so special? Social media, social networking and blogging are not just new tools; they are part of the revolution in marketing that started some twenty years ago when the internet became mass market. This article clarifies how social media tools and channels such as Twitter, Facebook and LinkedIn can make a real difference if used correctly and what this means for you. The internet provides massive amounts of information, leading to a power shift from seller to buyer. In the early days, providing search engines with the right keywords was essential to finding anything, but people soon tired of the ‘sales dish’. Instead, they sought independent information and reviews, leading to the growth of article and review sites, some of which have transformed themselves into blogs. This means we now have a growing body of people who use the internet to inform their purchasing decisions, so businesses must learn more about those customers’ purchasing challenges. Buyers have never been so well-informed, because information is only a few clicks away. Great! But, this causes a huge dilemma for sellers, who aren’t used to being challenged. Ignore the revolution. There are plenty of people who do not fully use the internet and never will. They are likely to be older, and therefore decreasing in numbers and economic clout. Dabble in social media. This is about migrating from offline to online. 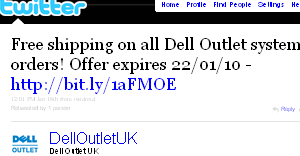 For example, sales brochures become blog posts, while tweets are about forthcoming sales or special offers. It’s more about continuing as before with these new tools, which is fine for the new internet user. Numbers of people who haven’t really used the internet to educate themselves are also shrinking, given the time personal computing has been around. Learn to master. Recognize that buyers will educate themselves before buying, so to grow, be where prospective buyers are. Speak their language at a pace that suits them. Take the lead. Accept that the buyer is king and uses the internet and social media to engage on their terms. This isn’t about having a string of tweets cascade into all the other social networking sites that accept Twitter. It’s about understanding how prospective buyers want to engage with you and using the appropriate channels to do that. From my perspective, this is where sellers are in relation to buyers (see graph at right), though I welcome different perspectives. 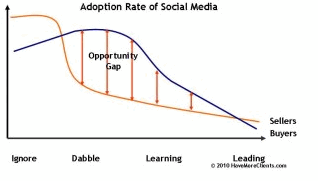 There is a huge opportunity gap for sellers to learn how to use social media and become leaders in their market. Since social media is about conversation and networking, the viral element can help any seller gain leadership. Give your buyers and prospects a place to comment and ask questions during a teleseminar, conference or even respond to consultation documents. Yes, it’s a public space but not all the material needs to be divulged. After all, it’s about conversing with people who have said they are interested in you and your position. Connect on Facebook with ComMetrics and MaxWeb. There are lots of ways to use this tool, such as giving information on topics you know interest your market. If your buyers are Human Resources managers, then information on employment law, payroll and employee engagement would be of interest regardless of what you are offering. 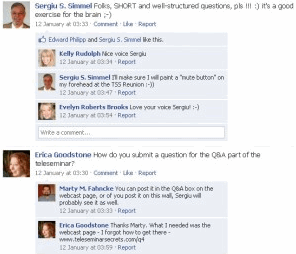 Ask for comments on your blog posts and respond to mentions. If people have taken the trouble to send you a message, acknowledge them just as you would in the ‘real world’. Choose from the 100 best Twitter tools. Join appropriate groups or learn what makes a good group and start your own. Good groups have discussions where people learn more about each other and relationships are fostered. The opportunities are endless. Wander in to LinkedIn’s Answers section and answer a few questions; this builds credibility with a large audience. Finally, have a complete profile, so people can see who you are and what you do. 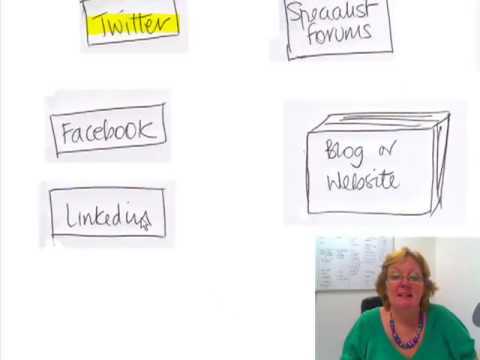 New to LinkedIn – How to Use LinkedIn video. Time management – 3 golden rules for best practice: Xing and LinkedIn. And remember that any social media activity can be used in conjunction with your continuing offline marketing. Sellers have been pushing messages for the past 50 years, but this has lost some of its effect. There are big changes afoot, as evidenced by the diminishing circulation of printed newspapers, the fortunes of commercial TV stations and the move from print media to online. People are no longer willing to be fed information and have message pushed at them. The day of attracting people with good content is upon us. Those who seize the day now are likely to have a sustainable advantage in their marketplace, just like those who had a website in the early 1990s. For push-adverse buyers, sellers have to adopt a passive method of enticement. One way is to make better use of Lead Magnets on your website and blog, though they have yet to gain their rightful place in the marketing mix. Make sure you use them to continue the conversation. Buyers are more powerful now and this will continue for some time to come. If you want your marketing to be effective, take the time to understand what social media offers. Used in conjunction with traditional marketing, it will catapult your firm to market-leader in your field. Please, leave a comment! We love to hear your thoughts: how do you feel about Twitter, Facebook and LinkedIn and your business? What is your experience with this subject? Have any tips to make sure we use social media more effectively? Please share your insights. Article source: ComMetrics – Social media: What is so special? I am so glad that you agreed to do a guest post on this blog and I look forward to the next one in about a month or so. In the meantime, I wanted to leave a comment and share some thoughts here if I may. <ul>A – I agree that buyers have never been so well informed as these days. As a government agency, consumer brand or a seller of consulting services you are faced with costumers that know what they want. Your clients know much about you and they are demanding to get value for money. B – Dabble in social media is most certainly something that everybody should consider. The question for a small business is which social media channel and/or community to choose first. I would urge everybody to get into blogging first. Content that matters to clients is a critical first step and for this purpose, a corporate blog is a great place to start. C – There are so many social media communities or channels that it is difficult to make the right choice. In other words, while LinkedIn in may be good for one thing, Twitter could be for another. For instance, I use Twitter to get information and gain insights from the people I follow. For me, LinkedIn, Xing or Viadeo are all useful in my work. But it is not necessarily to acquire clients but, instead, by joining some groups. In my case, the groups I joined discuss topics and share insights about issues I am interested in. In turn, I can learn a lot from fellow group members. Facebook, honestly I still don't know if it is worth the effort… I am there as an individual, we have a fan page, even a group about Europe – Social Media Metrics. But I am not sure at this point. I would maybe add: You need to define what purpose social media will serve for your company and continuously assess if you are still on target a few weeks from now. Like football or baseball, reading about social media is one thing but you have to practice the game in order to become better at it. So we better start today. Yes Urs, taking your last point first. Agree you can read and watch but it's not until you participate that a business owner can really get the measure of what will work. I think Facebook is a more difficult one to crack and I am trialling different approaches now. I set up a new page for Have More Clients and will be using it in a different way that many of the fan pages I am a member of and have observed. I will be using it as a forum for people to communicate whilst I am delivering a teleseminar and face to face seminars. And, will be writing about my experiences! Interesting your comment about blogging being the first activity and, I counsel caution here. Please only start blogging when you know where you want your blog to do and attract people. A lot of people start blogging without it being part of their overall marketing plan and then it falters. Be clear what you want to be known for and how that links with your services, THEN start blogging. Oh, and use your own domain, don't blog from a sub domain of wordpress for it will have much greater impact on your readers. I know there are links and SEO to consider but this has to be balanced with your overall positioning and web presence from your market's perspective. “Please only start blogging when you know where you want your blog to do and attract people. 1 What is the purpose of social media for your company? 2 What is social media's value proposition? 3 What results within what context must be achieved with social media? 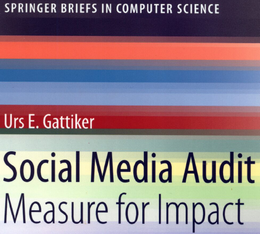 4 Besides a strategy, what does effective benchmarking of social media require? By addressing the above four questions one can then decide how to use the blog as effectively as possible. Maybe one will decide against blogging. However, the same work is required before one launches a product page on Facebook or engages on LinkedIn. I think for twitter you can build a presence without having a blog. You can use it for research into what's hot in your market. You can share information from others and you can do all this before getting a blog. Businesses need market research in order to be perceived as the expert. Twitter and LinkedIn are a great tools for this and can be used before a blog. But, in any instance, it is better to have a plan as set out. This is a great post about how the balance of power has shifted. I think it also points back to the power of building good relationships, being authentic and being really focussed on serving your market. It seems to me that one of the really big challenges for people using this medium is how to get your message really clear. But in some ways it's relaxing…the more authentic people are..they need to focus on getting people into their sales funnel (but in an easy non-pushy way). Interesting point Anne about getting your message really clear and, this has never been so easy. You can always gauge reactions with giving titbits and seeing what creates more buzz or gets the better response. Some things I tweet about that I find interesting seems to fall on deaf ears whilst things I think are old hat are taken up and retweeted and discussed on blogs etc. From the layman, learning about your market and what they “floats their boat” has never been easier. The issue remains is time but that's always been a finite resource. The other point you make that I liked is about “power of building good relationships, being authentic”. You are spot on here. With Social Media, you are transparent whether you mean to be or not. People see who you are and what you offer. I've seen a few people get tripped up with this. Transparency and authenticity aren't optional – it is what happens… charlatans beware! Excellent post. You really break it down nicely in terms of how a company can use social media for buyers and prospects. One thing I might add is that a company must be prepared to respond to negative comments as much as queries, questions and positive comments. Once you are out there you have to deal with whatever comes your way. I have used Twitter, in particular, to contact a few different companies when I was having difficulties with their product or service (ah, technology). I decided to use Twitter to see how these companies would respond on this platform and my situations were all real (that is, not fabricated for the purpose of an experiment). Two were responsive and one did nothing. Guess which one I will no longer use? Not out of spite mind you. I understand a company may not necessarily solve everything for me via Twitter, but no response at all sends the signal they don't care to help in any way. The two-way street of social media may have some bumps and potholes and a company must be prepared to deal with them. It's not all cruise control. I've done the same thing and talked about a difficulty with a particular Global supplier expecting to have some comment but silence. And, I think that is a reflection upon where companies are. Most are at the Ignore or, at best Dabble stages. This means they are missing out on the two way communications that Social Media affords. And that brings me back to an area that I have posted comments about on this blog that its about a mindset change of companies pulling customers and clients towards them rather than beating the sales drums and expecting the people to dance to their tune! Excellent food for thought! It is great too to see someone who does what she “preaches”. You are a good model of using Social Media. Your mention of LinkedIn got my attention – this is a tool we have neglected but then again one has to balance time and energy spent with all Social Media and other aspects of one's business or service. We still use e-mail a lot for customer service for example and the good old Newsletter is still a valuable way to communicate with our customers. Thank you Gilles for your comments. LinkedIn can be overlooked but, I think for those companies trading with other businesses, it is an essential site for networking, building relationships and employing! Your comments about email and newsletters are important because these are the tools companies will still be using to maintain contact and build the relationship. Even though pundits forecast social networking sites will replace email, this won't be overnight… we still have to use the existing tools and methods. And that is what makes change exciting but also a drain on already finite resources. – If I have more followers than my competitors am I really more successful as a marketer? – Or do I measure my success more by engagement and mentions/retweets? – Or, are we all just drinking the Kool-Aid unless these tools actually lead to increased customers and revenues? Personally, on behalf of a client and speaking for myself, I've yet to see new business or revenue streams from the tools that I use (LinkedIn and Twitter). LinkedIn has helped me to connect with more smart and interesting people, which is awesome. Twitter has helped me to learn more about the world and the industries that I'm involved in. This is certainly valuable, but in terms of financial ROI, there has been none. So, I think at the moment we are all swept up in the tidal wave of social media and in a year or so we're going to have to take stock and determine if we (business at large) have actually benefited from it in a way that justifies the time? I know that some people have gained clients and revenues directly from their social media participation, but for myself, despite regular involvement, I mostly wonder if I'm just shooting into the breeze. Many business people likely have a similar viewpoint as that of one of my clients: get as many followers as possible on Twitter. Sign up for a Facebook page, even though when we have no idea what it is going to do for us, but we have to do it to stay relevant…blah blah? It may sounds as if I am a SM naysayer but nothing could be further from the truth. I strongly believe in customer feedback, community and interactivity around a brand and products. I probably spend a couple of hours per week on Facebook chatting with friends, find myself sometimes tweeting away the time on Twitter instead of doing my paid work, and checking out people's resumes on LinkedIn. I love the tools, see the potential yet sometimes wonder if I wouldnt be better off writing that novel or short story….and getting outdoors more or reading a book. This is a great comment. I felt the urge to write a reply to you straight away. I wanted to share how I feel as a business owner like yourself. Your point that it is difficult to know what these social media activities can do for your business I can surely relate to. – Facebook, if 30% of your clients use this social network for business purposes – not just to chat with friends, get on it – otherwise dabble in it to see what it is maybe but don't waste time. I can tell you we have about 15% of our clients use Facebook but primarily for staying in touch with family and friend not for business purposes. With Twitter it is less than 5% using the technology. I also agree that neither Twitter, nor Facebook or LinkedIn for that matter have done much for my bottom line. However, these social media destinations or networks have helped me to collect information that support my efforts in establishing myself as a source for valuable information regarding #webanalytics #usability and #metrics as well as #risk management. Getting a sale that I can attribute to either one of these two technologies is more tricky and I can count these cases on one hand for sure. But you and I probably agree that social media is not about selling but fostering social engagement instead. And here these technologies have helped me a great deal. I do interact with clients, peers and other experts…. In conclusion, people teaching us how to use these social media channels do, of course, sales from using Facebook or Twitter. But if your product is building power plants, trains or doing software engineering work, I doubt that Twitter or Facebook will result in sales. So set a purpose, check a few months down the line if the tool helps you realise the purpose and if not, either change the objective or else take other action. But action we must take to pay the rent at the end of the month. I hear your frustration and understand your concern. I have made sales through Twitter and Linkedin but nothing from Facebook as yet. But, I am working on it! The sales haven't been in direct response but, in response to posts, information sharing and demonstrating my expertise. But, this is my business. I help Service businesses to become known as experts in their markets and to show that my techniques work, I use them in my own marketing. 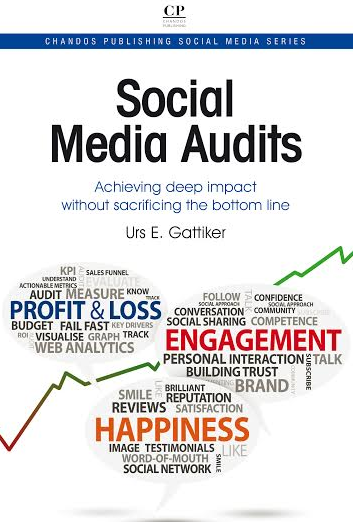 The metrics need to be there but also an understanding of how to make social media work for business. As you know there is a big difference between, browsing and chatting on social networking sites and being focused on what you want to achieve in the longer term. This is why I showed on the graph that most companies are either ignoring or dabbling. And partly the reason why individuals are more experienced is through this personal contact and networking by the virtual water cooler. But, this is different to how businesses will do it. If we bring into the discussion, content marketing and that's about demonstrating your expertise, your approach through articles, videos, podcasts and such like, then you can use your social media presence in conjunction with your content to demonstrate your offering, your value and expertise. The fact that you have commented on this post, Polly, means you are ahead of the mainstream population with adopting social media and that also brings with it the uncertainty and the cutting of teeth that newness brings! I draw the parallel to Web 1.0 when the internet and websites burst into mainstream media. Yet, it took nearly ten years for businesses to include websites into the marketing mix, and even now, not everyone has. So 2009 saw Twitter burst into the mainstream media, I guess it won't take ten years but it will certainly take a few before we see the majority of businesses using it, or other social networking sites, in some form. Take heart! Look at how you can integrate your social media into your traditional marketing thus delivering an integrated approach. Thanks Karen and also Urs! I realize now that it's a matter of managing resetting expectations depending upon your business. I do think there is value but when you're a sole proprietor, it's easier to spend the time because you're only accountable to yourself. If you're doing this on behalf of a client or as an employee one must be careful about time versus benefits but I do agree that there is absolute benefit in creating community and interaction with people in your broader network. I'm still determining how to measure the value for my client but personally speaking, I am always learning so that's a good thing. I'm also realizing that I need to — for myself and possibly from a client — toot the horn just a bit more… I never do this on my account for myself other than occasionally tweaking articles I have written. But in terms of sharing my own expertise as a writer/marcom person, I never do it. Likely because I don't often have time to write about this on my blog these days but I'm going to make a goal to develop more “instructional” articles about my industry more often this year. Very interesting, food for thought and I will study this. Meanwhile I am off to figure out how to set up a fan page! I totally agree with your post.Social media has influenced our lives in a great manner as by allowing us to connect with friends and share your thoughts together.And also it helps in business by communicating through it. Social media is an excellent tool for businesses seeking to understand the emotions and thinking of their target customers. nnWith social media, businesses can less intrusively research their customer needs, wants, purchase / buy motivations … in other words it acts like a more friendly customer relationship management (CRM) tool. Social media is an excellent tool for businesses seeking to understand the emotions and thinking of their target customers. With social media, businesses can less intrusively research their customer needs, wants, purchase / buy motivations … in other words it acts like a more friendly customer relationship management (CRM) tool. Next post: Engaging comments: Where is the beef?